A once in a lifetime adventure! 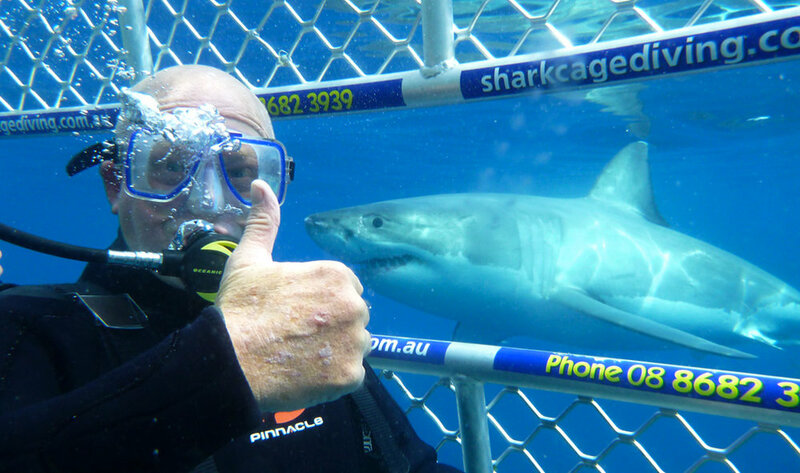 Dive with Great White Sharks. Day 1: Meet at Best Western Palms Hospitality Suite San Diego and enjoy a complimentary transfer to the ship docked in Ensenada. Day 2: Dinner time arrival at Guadalupe Island with a nice relaxing evening at anchor. Activities: Safety Briefing, Diver Orientation, Shark 101, Cocktail hour at beautiful and peaceful anchorage. Day 3: Cages open at 6:30 AM. First submersible dive at 8:00 AM. Dive until dusk! Activities: Our famous Mexican taco Fiesta on the upper deck, Shark ID. Day 5: Cages open at 6:30 AM. Submersible diving starts at 7:30 AM. Cages close at 5:00 PM. Activities: Shark ID, Cocktails with friends. Day 6: At sea, arriving in Ensenada approx. 2:00 PM. Coach , San Diego Airport, or Best Western Island Palms Resort San Diego. Activities: Trip Slide Show Our coach should arrive San Diego by 7:00 PM if there are no customs or weather delays. Bucket List Trip! Sharks, Sharks, and more Sharks. To date 261 Great whites have been identified in this area. This is the “Owners Choice” trip for 2019. 6 day live aboard accommodation, all meals (continental breakfast, breakfast, lunch, dinner and dessert), non-alcoholic beverages and snacks, daily room service, towels, in-water divemastering, end of trip DVD and onboard facilities such as the hot tub and lounge. Coral Key Instructor Leader, Pre-Trip Information & Get to know you party, Round trip transfers, Hotel Accommodations 1 night in San Diego, Unlimited dives a day, CK Trip DVD, Souvenir T-Shirt.